This is one of my favorite go-to recipes when the weather gets brutally sticky. And I am an old hand at dealing with the sodden end of summer, for nothing is as hot and humid as August in Taiwan. Unless it’s September in Taiwan. I used to indulge in this delicate gelée when I worked at the history museum. 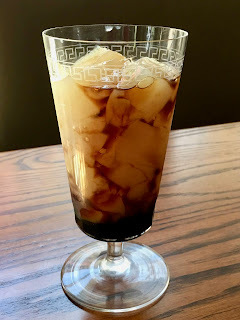 On those days when it was too hot to work or even string a couple of thoughts together, my gal pals would grab me and a taxi for a quick trip to a local teahouse on Yuanling Street on the other side of the Presidential Palace. 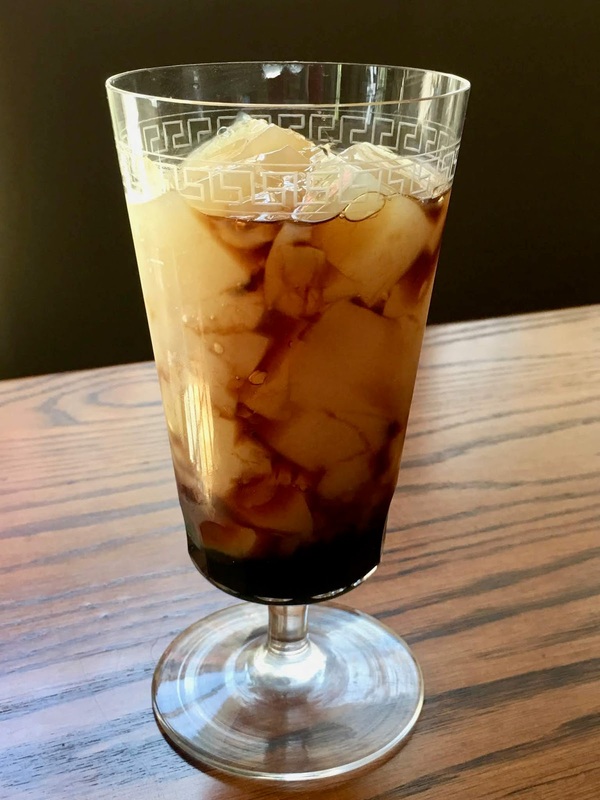 There we could hide upstairs in an air-conditioned room, munch on snacks, and eat oolong tea gelée drizzled with sour plum syrup. Once we were sufficiently refreshed and gossiped out, we’d then try to sneak back to work before we were missed. Sometimes this worked, other days we got chewed out. But it was worth it. This snack is just as delicious and cooling as it sounds. The tea coalesces into a hazy and opaque olive cloud, its gentle bitterness and floral notes forming the perfect foil for the puckery-sweet-salty-smoky flavors of the syrup. Unlike the black tea gelée of a couple of weeks ago, this is a very delicate confection that won’t obey your desires to keep it nicely squared up and Jello-y. Instead, you’ll be confronted with a soft custard consistency that is in its own way quite charming. 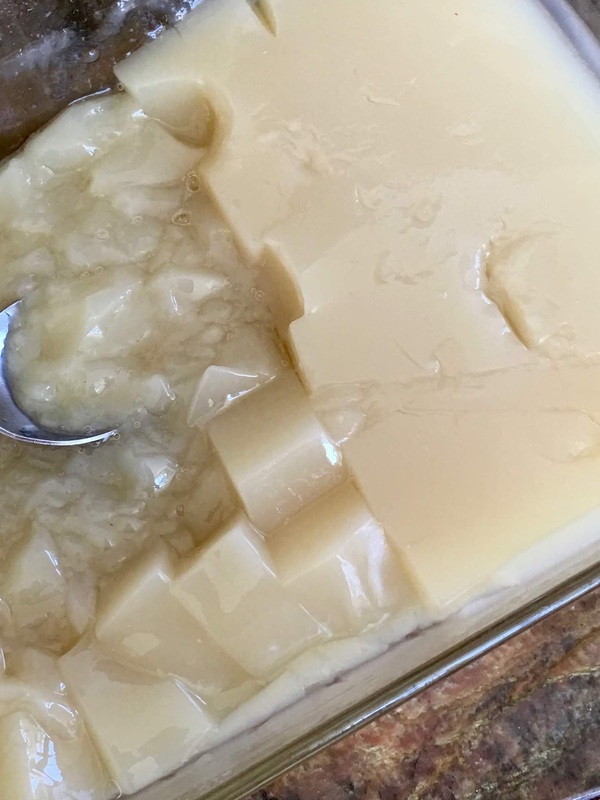 What I do is cut the gelée into cubes and then hope for the best. I spoon the puddles into the bottom of the serving bowls and then gently slide any cooperative bits on top so that it looks a tad more tidy. But no worries if you don’t end up with a single angle in your gelée because the texture and flavor will win over any doubting spectators. The reason why you don’t have a firm gelatin here is (I think) due to the enzymes in the semi-fermented oolong tea. This is also the reason why you can’t make gelée out of green, or unfermented, teas. I’ve tried. Lord knows. But every time I end up with a liquid on top and a thick mass on the bottom that looks and feels like a breast implant. Don’t ask me how I know this. Floral teas like chrysanthemum would work, but do avoid green teas like Longjing or Biluochun, unless you want to try to prove me wrong. Now when it comes to this recipe, be warned that since only two ingredients are featured here, you will have to spring for the best. 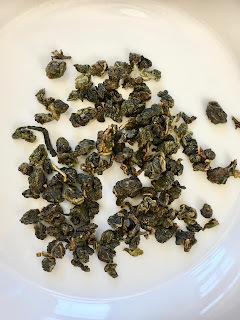 So, hunt down some really good tea that’s both fresh and fragrant – you can brew the tea leaves once more, by the way, and that extra cup of oolong tea will be terrific over ice. 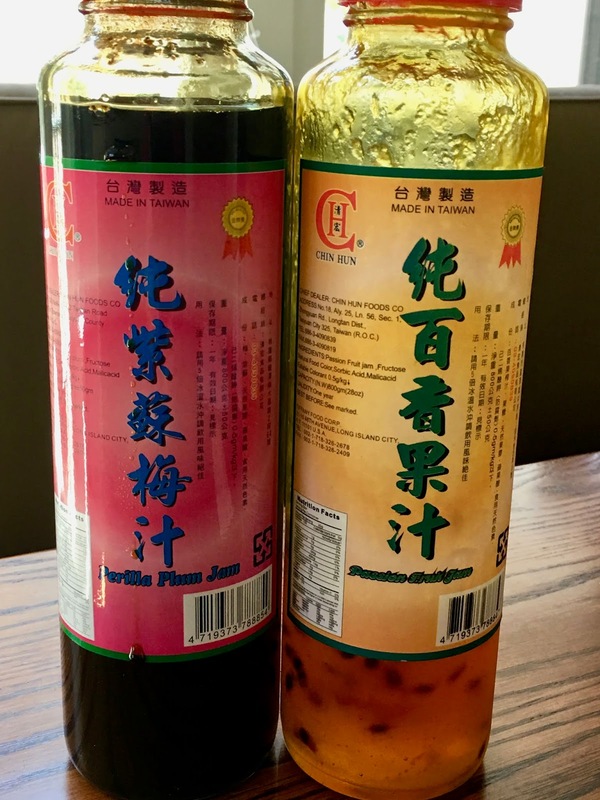 The sour plum and passion fruit syrup are concentrates sold in Chinese markets, and the best ones come from Taiwan. My favorite brand is Chin Hun. 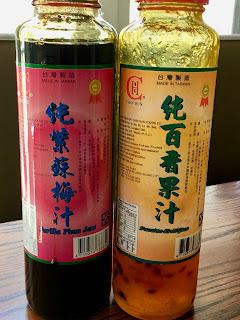 The sour plum is usually reserved chilled sour plum infusion (suānméitāng 酸梅湯), a classic Beijing-style beverage seasoned with things like tart black plums, hawthorn fruit, and licorice root. In Taiwan, the passion fruit syrup usually ends up on shaved ice and other treats. Like ice cream. So this is an ingredient you really want to have in your pantry. It has those crunchy black seeds in it, which give it a terrific texture and a special beauty. 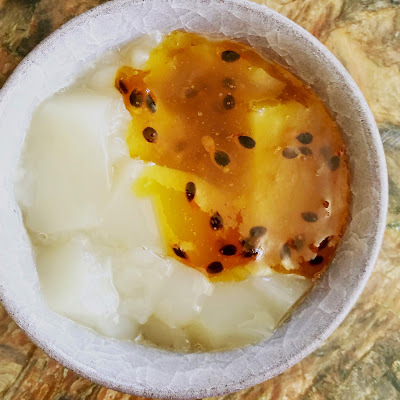 You can also use frozen juice concentrates, thinned-out jams, a good honey with some osmanthus syrup stirred in (yum), or whatever makes you happy. Whatever you decide on, please make sure it is relatively thick, because then it will sidle up to the jelled tea and form the perfect marriage of flavors and textures. 1. Make a very strong brew using the oolong tea and very hot water. Give the leaves time to fully steep – at least 10 minutes, but longer is better, and strain it out into a heatproof pitcher or bowl. Brew more tea, if necessary, so that you have 4 cups | 1 liter tea. 2. While the tea is steeping, sprinkle the gelatin over the top of the cool water in a medium work bowl, and then allow it to soften and bloom. 3. Microwave the tea until it is almost at the boiling point and then stir the gelatin until it is completely dissolved. Set the bowl aside to cool and chill it for at least 4 hours or (preferably) overnight. Scoop the soft gelée into serving bowls, pour a ribbon of the sour plum concentrate on top, and serve.